First issue of the journal dedicated exclusively to international water law published! April 2016 sees the publication of the first issue of Brill Research Perspectives – International Water Law (IWL) Journal. The fist issue has been published in both electronic and paper forms. IWL is a quarterly Journal published by Brill. Each issue consists of a single monograph in the range of 25,000 to 45,000 words. The Journal occupies a unique space in that it targets monographs that are deemed too long for a typical journal article, and too short for a book. Thus it is not intended to compete with other water journals; rather, the intention is to supplement their publication work. The Editor-in-Chief of International Water Law Journal is Dr. Salman M. A. Salman, who is a Fellow with the International Water Resources Association (IWRA) and Honorary Staff at the Centre for Water Law, Policy and Science (CWLPS), University of Dundee. Dr Alistair Rieu-Clarke, Reader of International Law at the CWLPS, is also a member of the editorial board together with Professor Laurence Boisson de Chazournes, Professor Gabriel Eckstein, Professor Lilian del Castillo-Laborde, Professor Makane Moise-Mbengue and Dr. Kishor Uprety. The IUCN BRIDGE programme has recently published report entitled, “A window of opportunity for the Mekong Basin: The UN Watercourses Convention as a basis for cooperation”. 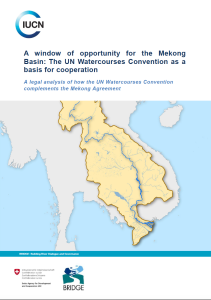 The paper provides a legal analysis of how the UN Watercourses Convention (UNWC) complements the Mekong Agreement, and provides a comparative analysis of the key substantive and procedural principles and obligations provided for in the two treaties. The result is a finding of overall general legal compatibility between the UNWC and the Mekong Agreement. Moreover, where gaps and inconsistencies between these instruments exist, the UNWC addresses them. The results of the analysis point clearly to the benefits of ratification of the UNWC by all the Lower Mekong Basin states and members of the MRC. It further recommends that the UNWC would reinforce rather than replace the Mekong Agreement and the MRC, as well as strengthening its broader normative impact as the most important legal instrument for the governance of trans-boundary watercourses globally. This collected work edited by Attila Tanzi, University of Bologna; Owen McIntyre, University College Cork, Alexandros Kolliopoulos, Ministry of Foreign Affairs of Greece, Alistair Rieu-Clarke, Dundee Centre for Water Law,Policy & Science (under auspices of UNESCO), and Rémy Kinna, Oxfam Australia was published in May 2014. The UNECE Convention on the Protection and Use of Transboundary Watercourses and International Lakes provides invaluable insights into the contribution of this international agreement towards transboundary water cooperation via its legal provisions, accompanying institutional arrangements and subsidiary policy mechanisms. Contributing authors – experts on key aspects of the Convention – address a broad range of issues, primarily concerning its: development and evolution; relationship with other multi-lateral agreements; regulatory framework and general principles; tools for arresting transboundary pollution; procedural rules; compliance and liability provisions; and select issues including its Protocol on Water and Health. ss this issue highlights the necessity for further understanding from the legal perspective. The concept of considering water security as a matter of ‘regional common concern’ is introduced to help international law play a more prominent role in addressing the challenges of global water insecurity. Ways for implementing such an approach are proposed and analysed by looking at international hydropolitics in Himalayan Asia. The book analyses transboundary water interaction as a ‘case study’ for advancing public international law in order to fulfil its responsibility of promoting international peace and security. A number of researchers and authors face the dilemma of publishing a research outcome that is deemed too long for journal articles and too short for a book. Indeed, most journals impose a limit on the number of words for an article. This limit has been consistently low, ranging from 6,000 to 8,000 words. On the other hand, most reputable book publishers would not consider for publication any manuscript that is less than 100,000 words. This leaves a large area of research product that fits neither the journal’s rules nor the book publishers’ requirements and that is out of reach of readers, which hinders dissemination of the results of such research. To fill this critical gap, Brill has decided to start a series of journals specifically designed for this kind of research output, Brill Research Perspectives (BRP). 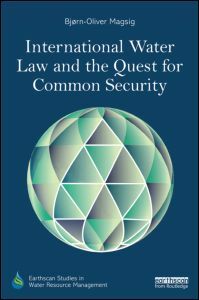 One of the journals under the Series, Brill Research Perspectives, International Water Law, is dedicated entirely, as its title suggests, to international water law. It is intended to be a hybrid journal and reference publication that combines the verification of peer review of journals, the high usage of reference works, and the pedagogy of textbooks. The Journal will be published in four issues per year, each of which comprises a uniquely focused, single monograph of 20,000 to 40,000 words (50 to 100 pages) that provides a comprehensive survey and critical analysis of and commentary on the state of scholarship for a given topic and includes an executive summary and a comprehensive bibliography. The Journal is intended for international water law professors, researchers, graduate and undergraduate students, and practitioners. Issues can be updated periodically by authors to revitalize commentary and to ensure currency of information, analysis, and citations. Each issue is assigned both a DOI and an ISBN, and both online and print (paperback) subscriptions will be available; single issues will also be available for purchase. The Editorial Board of the Journal consists of Dr. Salman M. A. Salman, as the Editor-in-Chief, and Professor Laurence Boisson de Chazournes, Professor Gabriel Eckstein, Professor Makane Mbengue, Dr. Lilian del Castillo-Laborde, Dr. Alistair Rieu–Clarke, and Dr. Kishor Uprety as Associate Editors. More information on the Journal can be found here.